It is my habit to post some kind of an original article on Monday and then a book review on Tuesday. This week I am going to reverse the order since the book review in some ways feeds into what I would like to say tomorrow. So bear with me. I have not read too many of John Stott’s books over the years. Still, in writing sermons and writing my own books there have been several times that I’ve relied on his commentaries and have always found them very useful–biblically accurate and full of wise points of application. Of course, I’ve often referred to what may well prove his greatest book, The Cross of Christ and I know of people who were saved after reading his book Basic Christianity (among whom are Derek Thomas). Though Stott had a couple of unfortunate aspects to his ministry (the most notable of which was some sympathy for the doctrine of annihilationism) he is a man who remained faithful to his calling and who served the church well. He is also a man who served the church in what was often a background role, which is to say that time may prove that he had a measure of importance that few people noticed at the time. Then again, in 2005 TIME declared him one of the 100 most influential people in the world, so I suppose someone has noticed. Just a short time ago Stott announced his retirement from active public ministry. But before he retired he penned a final book, the final of more than 50 he penned in his lifetime. The Radical Disciple draws attention to what he considers to be some of the neglected aspects of our calling as Christians. Why this title? “There are different levels of commitment in the Christian community. Jesus himself illustrated this in what happened to the seeds he describes the parable of the sower. The difference between the seeds lay in the kind of soil which received them. Of the seed sown on rocky soil Jesus said, ‘It had no root.’ … Our common way of avoiding radical discipleship is to be selective: choosing those areas in which commitment suits us and staying away from those areas in which it will be costly. But because Jesus is Lord, we have no right to pick and choose the areas in which we will submit to his authority.” And so in this book he seeks to consider eight characteristics of Christian discipleship that, though they deserve to be taken seriously, are too often neglected. The areas he focuses on are these: Noncomformity, christlikeness, maturity, creation care, simplicity, balance, dependence and death. Naturally some of these will be a little more controversial than others with simplicity and creation care topping the list, I am sure. In the chapter on creation care he indicates that he believes man-made climate change to be an imminent danger while in the chapter on simplicity he sides with Ron Sider to share a document dealing with issues related to justice, international development and other hot-button topics. Among the strongest chapters, at least in my assessment, are those dealing with maturity (a topic near and dear to my heart) and dependence. To be honest, there are some ways this book is unremarkable. 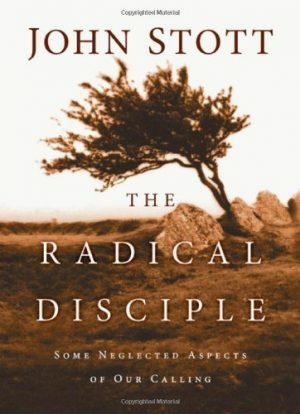 It has its strengths and its weaknesses, as do all books, but for a title calling people to radical discipleship, it seems that it contains few truly radical ideas. At the same time, I believe it has genuine value; its value comes in who authored it and when he authored it. The book reminds me just a little bit of Jerry Bridge’s Respectabie Sins. In both cases the author is an older man who has seen the church through ups and downs, through good times and bad. Both men have traveled extensively and both have returned with observations. Bridges observed sins that Christians are prone to overlook or sweep aside while Stott observed areas in which Christians are not fulfilling their calling. In both cases, the book would mean a lot less if it was written by an author in his thirties. But with age, with experience, with a long and faithful ministry comes the right to say certain things, to make certain sweeping observations. Like Bridges, John Stott has had a long and faithful ministry and has earned the right to be heard. He has had the wisdom to know when to retire, when to step aside from public ministry (and seriously, how many men write one book too many and continue on in ministry for too long?). And if a man of Stott’s stature pens a book outlining eight ways in which the church needs to do better, I think we would do well at least to read and consider. Few of us will agree with all eight emphases, I am sure. But all of us would do well to at least think them through and to see if there is a call here that we need to heed. I can testify at least that this book offered challenges to me.